PEPPERMILL INTERIORS — NEW NAME, SAME OLD US! Welcome to Peppermill Interiors. Our website has had a bit of a facelift, and you may think your web browser has taken you on a jolly journey, but don’t worry – we promise it is still us! You may have seen some of our new branding already over the past couple of months – perhaps you’ve been given one of our fancy new business cards, or visited the Peppermill Interiors stand at The Bar & Pub Show in October – or maybe you’ve just arrived for a browse around our website and noticed something has changed. As our loyal customers will know already, in recent years our focus has changed dramatically. Instead of antiques, our warehouse is now filled with a large number of new items, as well as lots of quirky vintage and industrial pieces. We no longer specialise in ‘old stuff’ (although, the odd item does still manage to slip through the net and find its way into our warehouse) and our old name has become less and less representative of the products we sell and the service we provide. Our customers have changed over the past few years as well; instead of selling one-off items to collectors, we now sell large quantities of stock to bars, restaurants, hotels, pubs and coffee shop chains, as well as countless dining tables and chairs to our domestic clients. And, it isn’t just dining tables anymore either – it’s lights, shelving units, armchairs, bar stools, quirky vintage furniture and unique industrial items you won’t find anywhere else. We moved to new premises at the start of 2016 and our new showroom has given us the chance to really showcase the fantastic range of products we have available. So, it made sense to change our name to better reflect us as we are now! Although we have changed our name, we can assure you that everything else has remained the same. We are still a family-run business, which prides itself in its quality products and professional approach. As a customer, you can still expect the same great service from Peppermill Interiors, that you had previously with Peppermill Antiques and if you visit our showroom, you’ll see the same faces you were dealing with before. We can also reveal that we will soon be having a shiny new website. The new site will enable you to complete your order online, however, if you prefer to speak to an actual person – we will always be more than happy to have a chat about your order over the phone. We’re really excited about our new name, and we think it suits us much better. 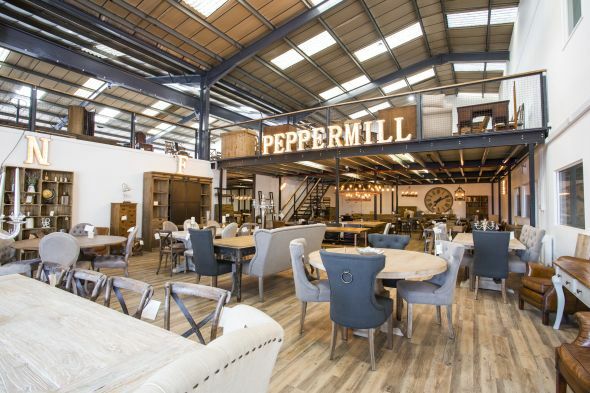 If you have any questions, comments or would like more details about Peppermill Interiors, you can email us at: sales@peppermillinteriors.com or give us a call on the usual number: 01543 375872. To keep up to date with our latest news and to be one of the first to know about our new website launch date, you can join our mailing list.